Thread: Any doubts about Climate Change? Id like to remind u bullshitnoob that he also said that the environmental movement has been hijacked bye cryptofascits and Marxists. Which one are u and hairy and landreth and the others who constantly push openly false twisted info. None of you fall into the environmentalist category your all from the extreme psycho Stalinist left. And to many have forgotten just what stalin did. Secondly id like to point out the bottom graph nemo put out which show that co2 and the worlds temperature are actually now at historical lows, drastically low, not high. These historical lows are warnings of extreme danger and how we can slip back into another ice age all too easily which is magnitudes more dangerous to life then 2 degrees of warming which is screamed about but never seen. And none of you say a word about how he reveals the real danger the very opposite of what you say. Another real danger is that he calls you cryptofascists and Marxists and that is no exoneration of any of you but an open condemnation. Of course mans pollution affects the world no one denies that, exactly what is the amount of change created bye man is the real question. For example 3 times now the present head of the epa has been before congress and questioned, there are videos on utube of her answering questions. In all 3 senators openly state that if the us does everything the epa asks for it will only reduce temps bye .1 degree in 100 years and then why should they destroy the us economy putting tens of millions out of work, destroying tens of millions of lives, in effect destroying the us. Her answer is always a variety of symbolism or we must lead the way. Lead the way to what? poverty, desperation, hopelessness. That is all you and your kind offer. To me that reveals clearly that it is all politics, power, and wealth transfer to yourselves. You and your kind will prosper while all others will sink into desperation. It almost fits to a t with paranoid Marxist conspiracy theories of the future destruction of the us and its way of life doesn't it. Marxist or cryptofascist which are you? Last edited by pulvarien; 28-12-2016 at 08:37 PM. It is also correct to say that human industrial activity has added input into the system and changed the climate further. That would be like a Christian embracing Lucifer. Get real. ...but they do... it's in the bible, silly. Last edited by CaptainNemo; 28-12-2016 at 11:07 PM. Seems to be getting moist in my pants , is this due to CO2? Try this if it works. It helps explain how C02 effects global warming. some may find it interesting. Best link on this thread. Some of the comments in response to that article are worth a read. its like saying a chip pan on fire will heat the kitchen up. the earth cracks more and volcanoes pump our coolants !! The simple truth is we don't know, we cant predict the weather a few days in advance, how can we predict it years. We have theories, ideas, hopes and fears. I fear a mini or worse Yuge ice age not global warming, that would be wonderful, to return to the days of roman empires weather. When Hannibal could ride elephants across the alps...... The warming periods ushered in centuries of growth and prosperity for the world, of course there some losers, there will always be winners and losers. first a word of caution. Clive Best is an AGW 'skeptic', and while he is more mathematically sophisticated than most AGW 'skeptics', he still breathlessly writes about the lack of warming over the last twelve years, and predicts cooling temperatures for the next decade because the lower uncertainty bound of the HadCM2 model short term climate forecast permits it. Any recommendation of one blog post by Clive Best should not be construed as a recommendation of any other blog post by Best, or the quality of his blog in general. As can be seen from his graph of the predicted IR spectra, he clearly gets the 660 cm-1 spike wrong as well, showing it as a dip (?!) for 300 ppmv, and as a barely discernable spike at 600 ppmv. That is so different from the obvious spike in the real world spectrum (at approx 390 ppmv) that you know (and he should have known) that he has got something significantly wrong. Before addressing that specifically, I will note two minor things he omitted (perhaps for simplicity). 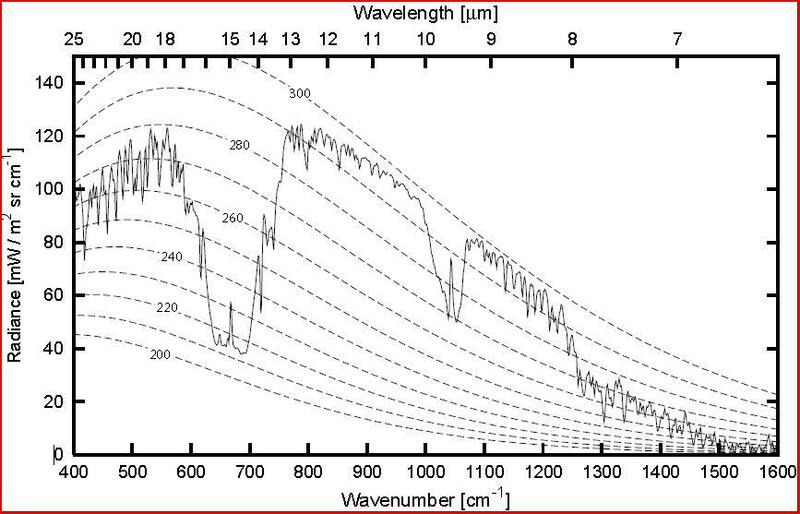 The first is that he has not included a number of factors that broaden the absorption lines. Broadening increases the width of the lines, but also reduces the peak absorbance of the lines. In any event, he has not included doppler broadening, possibly does not include collissional broadening, and probably does not include some of the other minor forms of broadening. The second factor is that he has not allowed for the difference in atmospheric profiles between the US Standard atmosphere and actual tropical conditions. Specifically, the atmosphere is thicker at the equator due to centrifugal "force", and also has a higher tropopause due to the greater strength of convective circulation. 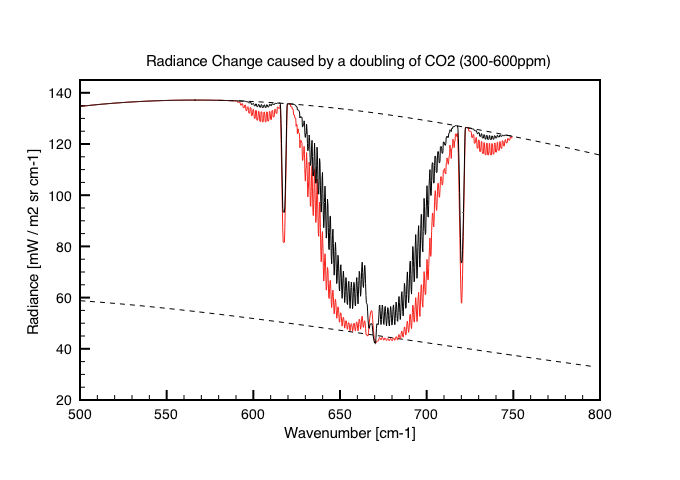 That later should reduce CO2 density, and might be accepted as the cause of the discrepancy except that mid latitude and even polar spectra show the same reduce absorbance relative to his calculated values (and hence higher effective altitude of radiation in the wings, and for the central spike). Although these factors are sources of inaccuracy, they do not account for the major error in calculation. That is probably a product of his definition of effective altitude of radiation, which he defines as the highest altitude at which "... the absorption of photons of that wave length within a 100m thick slice of the atmosphere becomes greater than the transmission of photons". That is, it is the altitude of the highest layer at which less than half of the upward IR flux at the top of that altitude comes from that layer. This definition is superficially similar to another common definition, ie, the lowest altitude from which at least half of the photons emitted upward from that altitude reach space. Importantly, however, this later definition is determined by the integrated absorption of all layers above the defined layer. Specifically, it is the layer such that the integrated absorption of all layers above it = 0.5. I think the layer picked out by Best's method is consistently biased low relative to that picked out by this later definition. There are two other common definitions of the effective layer of radiation around. "Here the effective emission level is defined as the level at which the climatological annual mean tropospheric temperature is equal to the emission temperature: (OLR/σ)1/4, where σ is the Stefan–Boltzmann constant." That definition can be generalized to specific wave numbers, or spectral lines, and is used by Best in an earlier blog post specifically on the subject. It also needs to be modified slightly to allow for the central spike (which comes from the stratosphere). The difficulty of such a modification, plus a certain circularity in this definition makes others preferable. The third definition is the one I give above of "the temperature weighted mean altitude from which the radiation comes". I take it that the three common definitions pick out the same altitude, at least to a first order approximation. In contrast, Best's definition in the blog post to which you refer is of by (in some portions of the spectrum) at least 6 kms. Despite this flaw, Best's blog post does give a good idea of the methods used in radiative models. However, his detailed results are inaccurate, in a way that does not reflect the inaccuracy of the radiative models used by scientists. This also applies to the graph shown by scaddenp @55 above, which was also created by Best. It is very indicative of the type of profiles likely to be seen, but should not be considered an accurate source. I discuss the accuracy of actual models briefly here, and in more detail in the comments. ^ well its getting well beyond my ability to follow, but what you have posted has nothing to do with the link. In the link he is trying to follow the derivation of an increase of 1.2 degrees C for every doubling of the concentration of CO2. It turns out that it is based on the assumption that the temperature increase of 0.6 degrees C since 1790 is entirely due to the increase in CO2. So it is a circular argument! well its getting well beyond my ability to follow, but what you have posted has nothing to do with the link. It is in the comments below. My point was that he uses a flawed methodology. Last edited by bsnub; 29-12-2016 at 10:53 AM. Not the link that was posted by hugh cow. If it is really true that this formula has been derived only by assuming that all “observed” temperature rise since 1750 is caused only by CO2 increases, then I fear this is a circular argument ! 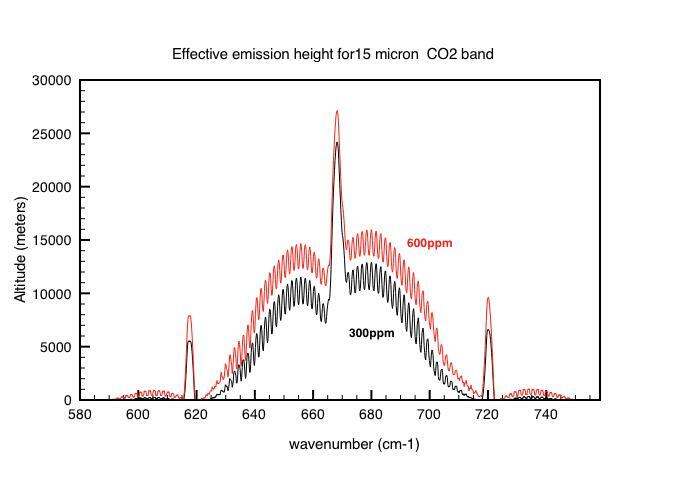 In main body of your link it points out the the way CO2 increases temperature is by pushing the radiative leaking of IR bands higher, so reducing the leakage, that is exactly what Best says in the link. I never knew that, it has always been shown that the more CO2 the more heat is reflected back. So what we are commonly told about the way CO2 increases temperature, is not a simplification, but a lie. Last edited by longway; 29-12-2016 at 11:47 AM. ^ Regardless the more CO2 in the atmosphere the more the earth warms. Much of the Marxists strategy on all arguments is to just outlast your oponents. Keep endlessly putting out gibberish with pretty pictures, graphs, with the truth buried in the details of details on page 745, index F. Knowing very well that less then 1 in a million can ever find the flaws. Graphs, pictures, smiling faces all look so great, photo ops everyone. Like hillarys boasts of flying to 138? countries. Wow flying to 138 countries [all on the tax payer dime] is rock solid proof of her credentials to be elected president??? REALLY siting in an airplane that often qualifies someone to be president? I guess that's why all those polluting, govt all expenses paid holidays all over the world to top tourist hotspots are so critical to study global pollution. And not just another corrupt tax dollar squandering rip off of the system bye the left. If any of it were true they would walk the walk instead of just talking the talk. It is greener to keep minorly polluting industries here then forcefully export them to the 3rd world where the pollution they put out explodes. It is greener to have all climate scientists forgo any international travel, [skype is available] whether work or holiday related to reduce global warming gas production. It is greener to have independent study groups confirm that all govt initiatives will actually have a measureable and significant effect that isn't bankrupting in the end. It is greener to force all govt officials scientists to have financial skin in the game in case it all turns out to be a scam. They must bear financial penalities to themselves in case its all a lie. Oh they will squeal over that one. What me take responsibility for destroying billions in wealth because I lied!!! But my fellow Marxists promised me theyd rig the system so that no matter what id never take the fall! And now TRiUMPh has been elected and I'm afraid, very afraid. Last edited by pulvarien; 29-12-2016 at 08:17 PM. There's not knowing, and there's not knowing the future with absolute certainty. Everything is about probabilities, and there's world of difference between not knowing at all, and extrapolating based on a mixture of sources. It's right to be sceptical about models, in a similar way you might be about political polls, because although models are derived from real data, that data is never complete, and has both irregular and much lower spatial and temporal resolution: it's a best guess. This is what I was saying about bsnub reading someone else's comments, and parroting them as though they were his own to blind you with science and try to sound like he knows much more about it than he actually does. Much of the Marxists strategy on all arguments is to just outlast your oponents. Keep endlessly putting out gibberish with pretty pictures, graphs, with the truth buried in the details of details on page 745, index F. Knowing very well that less then 1 in a million can ever find the flaws. Graphs, pictures, smiling faces all look so great, photo ops everyone. That's not strictly true... the safer statement would be "the more CO2 in the atmosphere, the more the earth's climate changes". It certainly isn't even or fixed, like stacking blankets, it's quite dynamic, and without definining the window you're looking at with this statement, it's a bit meaningless... do you suppose the CO2 just sits there in the sky accumulating until the Earth turns into Venus? Carbon dioxide causes about 20 percent of Earth’s greenhouse effect; water vapor accounts for about 50 percent; and clouds account for 25 percent. The rest is caused by small particles (aerosols) and minor greenhouse gases like methane. The very fact that the greens use such devious, convoluted, deceptive ways to push global warming puts the lie to it. If the science was overwhelming theyd not need to resort to devious, deceptive, bullying, slandering, insulting and out and out lying to convince us. The fact that they do screams the its all a lie in our faces. TRUTH and SCIENCE DOES NOT WORK THIS WAY. Sadly most people are totally overwhelmed with real life and take little notice except what their tv news tells them and the left knows this, so they bought up all the tv news networks. And then fox started one up damn them! But now the majority of the population knows the media is feeding them lies and no longer trusts them. But the media is so locked into its lying ways that they continue the lies of the left and Obama on the latest Israel for example and keep revealing themselves to growing numbers who see this and no longer trust them. The left is locked into their strategy and cannot seem to break the pattern that is destroying themselves. The wave is building, it has not crested and the lying left is on the losing end. No... this is just the politics of the left-lib cryptofascists, and it is their approach to everything. ..as you kind of describe. It's a cult. Group-think gone mad. What Orwell warned us about... but it does not mean that the scientific facts of anthropogenic climate change and pollution aren't real... the task is to wrest control of the pro-conservation agenda from the left, so that it doesn't get polluted itself by leftist ideas, nor conflated with leftist causes. The simple truth is we don't know, we cant predict the weather a few days in advance, how can we predict it years. The artful dodger was skillful too. You spastic I never claimed they were my comments. A fitting title for yourself and the many falsehoods you try to post up in this thread. remember when you claimed that the arctic was frozen solid and I pointed out to you that a massive luxury liner was in the process of circumnavigating it? You right wing lemmings have your heads so buried in tin foil conspiracy theories that your fail to pay attention to the most obvious reality's. Last edited by bsnub; 30-12-2016 at 06:52 AM. This is right out of Nazi propaganda page 1, when you lie, lie big, people tend to believe big lies more and lie often, keep on repeating it, people tend to think there must be something to it when its brought up so often. On notrickszone.com is an article about how eu companies have scammed the co2 trading emmisions scheme for 25 billion euros. Its detailed read it. No wonder so many companies and lefties and greens, corrupt all! have jumped onto the green bandwagon. Look at the money to be scammed from the little people. The article comes from derspiegel the german newspaper and the first link was from the site that cannot be mentioned climatedepot.com. and now with the revelation bye der Spiegel of the green/leftist/bigbusiness on the side of the greens and lefts!!!! scam of 25 billion euros in the carbon trading scheme. The 25 billion euro scam proves the whole thing was created to milk people of their money, the greens have been corrupted, everything they do and say is to retain power and credibility while they milk us of more billions. They don't want to talk about der spiegels article about how the greens and left with crooked big business scammed 25 billion euros. der spiegels article last week about how the green/leftwingers/business companies scammed 25 billion euros using the carbon trading scheme. And we are now approaching 2 weeks and the greens here are still running away from der spiegels story on massive green left wing corruption in Europe that has scammed 25 billion euros from the common people. That is one of the real reasons for the global scare, a scam to milk us. der speigel and the 25 billion euro scam bye the greens and left wing. But I wont let it go away here ill keep bringing it up every week just to remind everyone of the lies, corruption and evil that make up present days green left wing alliance. We haven’t heard anything from you in a while about the subject. Is there a reason? the greens here are still running away from der spiegels story on massive green left wing corruption in Europe that has scammed 25 billion euros from the common people. A closer look at one example country (not the highest taker on the list) to see who these industries/companies might be. Looking above, the companies/industries I have circled don’t look like the companies/industries that green left wing groups would support. In fact I know environmentalists support another type of action to show their disapproval of the companies I have circled. Maybe I should threaten to bring this up every week until pulvarien admits he misled everyone about the article he referenced.